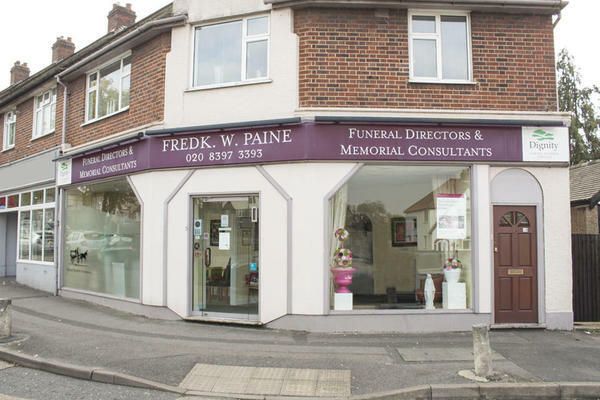 Frederick W Paine Funeral Directors in Chessington is proud to be part of the rich heritage that is Greater London, having been at the heart of our community since 1908. Our funeral home on Leatherhead Road was opened in the 1960s, and has been a renowned and trusted part of Chessington ever since. We are here to give families of all faiths and cultures the compassion and guidance they need after the loss of someone close. We are completely empathetic to your needs and wishes, and will make sure that every detail of your loved one's funeral reflects their life and personality; be it through the music, readings, pictures or anything you feel is right. Our services range from conducting bespoke funeral services, to crafting beautiful monumental masonry that can stand in remembrance to your loved one's life. We are always here for you, whether you need advice, assistance, or someone to talk to. You can call us 24 hours a day. Call us today on 020 8397 3393 to talk through your personal requirements. You can find us by Hook roundabout. Our staff are available 24 hours a day on 020 8397 3393 if you require our services outside of these hours.